NHL postseason awards are a sign that no matter what else a player may have done during his career, there was a season in which his performance was good enough to be recognized. 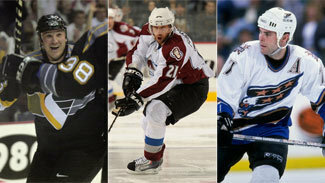 But not every NHL award-winner is a hockey immortal. For every Bobby Orr or Wayne Gretzky, who could stock a trophy shop with all the hardware they've won, there are players who were in the right place at the right time to get their names on some of hockey's most famous hardware. Gordie Howe and Maurice Richard played right wing at the same time as Bathgate -- and for better teams -- so it's easy to forget what an offensive force the Manitoba native was in the late 1950s and early 1960s while playing with the struggling New York Rangers. The Blueshirts' pre-war glory days were long gone, and Bathgate was the focal point of a team that was in the process of going more than 20 years without winning a Stanley Cup Playoff series. But Bathgate was a great player -- never more so than in '58-59, when he scored 40 goals and piled up 88 points in a 70-game season to set team scoring records. 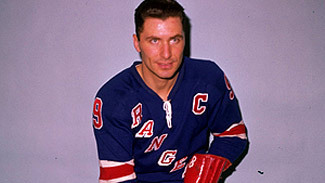 His performance was enough to end Howe's two-year run as the NHL's most valuable player and give Bathgate the Hart Trophy -- despite a late-season collapse that dropped the Rangers out of the playoffs. He was the best player on the Rangers for several more seasons before going to the Toronto Maple Leafs and winning a Stanley Cup in 1964. Bathgate is often remembered more for being the player whose shot cut Jacques Plante and led to the debut of the goalie mask, but his MVP award also deserves recognition. The NHL's regular-season scoring championship has been dominated by a few teams and a few players -- Wayne Gretzky, Mario Lemieux and Jaromir Jagr in the past three decades; Guy Lafleur, Phil Esposito, Bobby Orr, Stan Mikita and Gordie Howe before then. One of the few interlopers was Trottier, who had the best year of his Hall of Fame career in '78-79. With fellow Hall of Famers Clark Gillies and Mike Bossy on his wings, Trottier led the NHL with 87 assists and 134 points -- four more than Marcel Dionne and five more than Lafleur, who had won the scoring trophy for the prior three seasons. That performance was also enough to earn Trottier the Hart Trophy as the regular-season MVP -- and helped the New York Islanders dethrone the Montreal Canadiens as regular-season champions, though they were upset in the semifinals by the Rangers. Trottier's point total dropped from 134 to 104 in 1979-80, but he did go home with another piece of hardware -- the Conn Smythe Trophy as MVP of the Islanders' first of four successive runs to the Stanley Cup. There are few players in any sport who had a wilder ride than Carey, whose brief episode of brilliance was recognized 16 years ago with the top award given to goaltenders. Carey was the Washington Capitals' top pick in the 1992 NHL Draft after a brilliant high school career in Massachusetts; he turned pro two years later after a superb season at the University of Wisconsin. The youngster was the AHL's top rookie and top goaltender in 1994-95 before being called up by the Capitals and going 18-6-3 with a 2.13 goals-against average as a 20-year-old. By the fall of 1995, Carey was the Capitals' starting goaltender and posted perhaps the best season by a goaltender in franchise history -- a 35-24-9 record with a 2.26 GAA and nine shutouts, good enough to be recognized with the Vezina Trophy as the NHL's top goalie. But those 35 wins were nine more than Carey would manage during the rest of his career. He struggled in '96-97, and not even a trade to the hometown Boston Bruins helped him regain his form. By 1999, at age 25, he was out of hockey. When you think of Randy Carlyle today, it's probably as a coach -- he led the Anaheim Ducks to the 2007 Stanley Cup and now runs the bench in Toronto -- not as a solid NHL defenseman who had his career year at the right time. Carlyle had never had more than 47 points in his four previous NHL seasons before breaking out in a big way with the 1980-81 Pittsburgh Penguins. In a League that had Hall of Famers Denis Potvin, Ray Bourque and Larry Robinson still playing at an All-Star level for far better teams, Carlyle was named the NHL's top defenseman after scoring 16 goals and putting up 83 points despite playing on a sub-.500 team. Carlyle was traded to the Winnipeg Jets in 1983-84 and played until 1993, but never approached his '80-81 numbers again. The Calder is a trophy you can win only once -- after all, there's no repeating a rookie season -- and Selby happened to have his first NHL season at the right time. Selby had scored 45 goals with the Toronto Marlboros in his final junior season in 1964-65, then added a pair in a three-game call-up with the Maple Leafs. That was enough to earn him a berth with the big club in '65-66, and he put up respectable offensive numbers for that era -- 14 goals and 27 points in 61 games. Those totals weren't as good as another young Leafs player, Ron Ellis, had put up the previous season. However, Ellis had the misfortune to be a rookie in the same season as a young Detroit Red Wings goaltender named Roger Crozier, who won the Calder. Selby had no such competition and was named the NHL's top rookie. But having a trophy was no guarantee of a job in those days, and Selby spent much of the following season in the minors before returning to the NHL in 1967 after being taken by the Philadelphia Flyers in the expansion draft. Ironically, the Maple Leafs traded for him in 1968-69 and kept him for a couple of seasons. He went to the St. Louis Blues before finishing his pro career back in Toronto -- with the WHA Toros.